The brouhaha over Apple extending the battle against an overwhelming wave of annoying digital ads points back to something that never seems to change — regardless of how much technology changes. Content is King. Sure, old news is no news. But when some say the sky is falling, it’s not bad to point out that Henny Penny was wrong. Chicken Little just misread the evidence and went hysterical. Digital advertising is undoubtedly changing. But however much it continues to do so, strong content will still overcome it. Not content marketing in this case, although that is becoming a necessary subset. But actual, honest, solid, useful, interesting, quality content. We thrash this out in a recent episode of the Grow the Dream Show, ranging from Apple’s iOS9 release to John Deere’s Furrow magazine launched in 1895. First, a smidgeon of history. Print publications were long supported by display ads. The great majority of revenue came from ads, not subscriptions. To this day, many community weeklies are free to readers and driven solely by advertising revenue, most of which still comes from their print, rather than online, products. The advent of the internet wreaked havoc with that model. Print publications and radio and TV — the largest drivers of content through the 20th century — were hit on all sides by declining subscribers, which forced down ad rates and the number of advertisers, plus online competitors with comparatively tiny overhead costs. What’s happened is a huge shrinkage in those industries and a tremendous broadening of content-generating outlets, which is sometimes called the democratization of media. That means advertising options exploded, further diluting the available advertisers for traditional content providers. The response was usually slow and clunky at each step, but most recently has been to overwhelm visitors with banner ads, column ads, popup ads, page takeovers, and automatic video launches. But further, Google has risen to mug us with advertising by invading our online lives to hound us with the history of every stop we’ve made on the digital highway. This problem is magnified on mobile platforms because of screen size and bandwidth. It’s so bad that Big Brother in the United States (the Federal Trade Commission) and the European Union want to put a stop to it. This, of course, is a horrible route to take for everyone except the controllers. So Apple pops out with a private sector offer. It not only permits, but is enthusiastically encouraging app developers to block or remove tracking and even advertising from their apps. Apple’s motivation is undoubtedly the bottom line. Their overarching strategy has always been the experience. Loyal users must continue to love using their biggest seller, the iPhone. If that means severely cutting down on ads, so be it. If that happens to smack Google’s revenue model, well, no tears will be shed in Cupertino. Is the future to go native? One thing for sure: Advertising will always be with us. Apple’s action does not mean the end of ads. It may mean a reduction, but too much money is pinned to ads, and Apple only has a share of the mobile market. But if it is a portent of things to come, companies will still need to get their message to potential customers. One niche that is gaining in popularity in response is native advertising, which has gone from $1 billion in 2013 to $2 billion this year and is projected at $5.7 billion by 2018, or 27% of desktop and mobile advertising, behind only social media, according to BI Intelligence. This looks to become a permanent resident in the online advertising field. It gets around ad blockers both digital and traditional. We’ve always been able to block ads by not looking at them, but that does not work as well with native advertising because it is disguised so well at so many levels. However, it has its detractors. In the era of declining trusted content, native advertising may be “another step in the degradation of quality that has been going on for a long time,” as co-host David Johnson put it on the podcast. Superior content will always win out over time. It’s a law of nature. That is why content marketing — to which native article advertising is a cousin — is such a successful play for companies. An excellent example from the show was that John Deere launched a magazine in 1895 called the Furrow to help farmers with farming techniques. It provided strong, quality content to a targeted audience, and it is still in publication. More importantly, John Deere became a truly trusted name in the industry throughout the 20th century. Furrow probably helped that. This was content marketing that worked with zero modern technology because the concept will always connect, even if the delivery methods change. So here’s the takeaway. 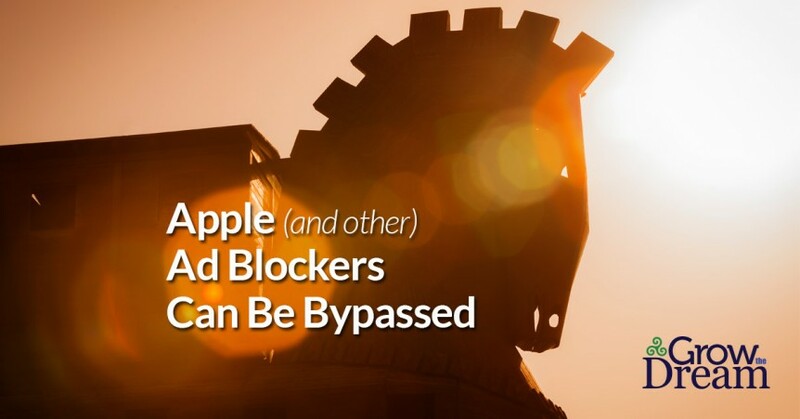 If you are a business that uses advertising, Apple’s decision could really affect you. But if you are producing great content as your primary driver for acquiring new traffic to your website and potential customers, you’re still gold. This just does not affect you. In fact, removing some paid clutter may actually help. Listen to the full episode of the Grow The Dream Show podcast on ad blocking and more here.